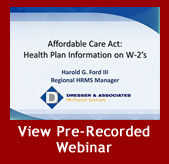 Beginning with the 2012 W-2's, the ACA requires all employers to report the cost of coverage under an employer-sponsored group health plan. This 2012 requirement was optional in 2011. Sage's Q4 2011 tax table update provided functionality to report this on next year's W-2's, however they did not provide a lot of detail for customers as to how to set this up.